Dr Wade H Elmer – Improving Plant Disease Resistance: Can Nanoparticles Deliver? Crop disease can have an enormous impact on farming productivity and profits. A plant’s resistance to disease has been previously linked to micronutrients, which control key biochemical processes. Dr Wade Elmer of the Connecticut Agricultural Experiment Station has carried out research showing that nanoparticles can provide an effective, practical method of getting vital micronutrients such as copper into crops. Managing nutrition in any organism is fundamental for its health and ability to resist disease. In plant pathology, three key factors are recognised as important drivers behind disease development. These factors are the presence of the pathogen, the environmental conditions that allow the infection to thrive, and the susceptibility of the plant itself to the disease. Altering any one of these three things will affect how severely the plant is infected, or whether it becomes infected at all. One way that this ‘disease triangle’ can become altered is through environmental change – for example, increasing he soil’s moisture content can make certain pathogenic organisms more aggressive. Plant pathologists work to reduce the probability of plants becoming vulnerable to disease, by looking at ways to positively influence one or more of the three parts of the disease triangle. Sometimes this involves trying to reduce the presence of pathogens through chemical or biological treatment of the soil. Other methods include figuring out how to make the plant environment less conducive to infection taking place, by altering moisture content, temperature or light levels. ways to improve plant nutrition to reduce disease susceptibility. Poor plant nutrition, where the soil is low in vital nutrients, is a well-known factor that can lead to reduced resistance to disease. In these nutrientpoor regions, plants cannot maintain a healthy metabolism and can often become vulnerable to infection. For Dr Elmer, his work is a something of a family tradition. ‘My father was an entomologist and my grandfather was a plant pathologist so I always had exposure to plants and agricultural research,’ he explains. Just as with different animal species, each type of plant requires a different diet of nutrients, comprising nitrogen, potassium, phosphorus and many other elements in greater or lesser amounts. For agricultural crops, there is a strong financial incentive to obtain the perfect balance in order to achieve profitable yields. Therefore, scientists like Dr Elmer spend long hours setting up experiments and working out the optimal nutritional balance for individual crops and crop varieties. In 2015, Dr Elmer published a fact sheet on the effects of mineral nutrition on plant health, specifically focussing on disease suppression in agricultural crops. In this article, he demonstrated that several elements are vital for improving plant resistance to disease, and also showed that for each of these elements, a number of different metabolic pathways are important. Within the complex biochemistry taking place in a plant, Dr Elmer showed that micronutrients – elements that are present in low concentrations but are vital for specific processes within the plant’s cells – can play pivotal roles in the plant’s ability to resist infection by a number of diseases. Multiple methods exist for supplying micronutrients to plants, some of which are more effective than others. 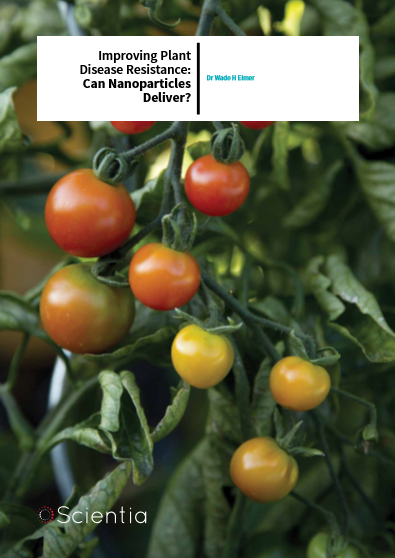 Recently, within the agricultural science community, there has been much excitement surrounding the potential for using nanoparticles as a micronutrient delivery system. Nanoparticles are particles of extremely small size – on the order of billionths of a metre in diameter, much too small to be seen even with an optical microscope. Often, micronutrients cannot readily move through the soil and become tightly bound to soil particle surfaces, making them unavailable to plant roots. However, nanoparticles are often much more mobile and accessible, allowing them to be taken up and used by plants much more effectively. In research published in Environmental Science Nano in 2016, Dr Elmer and his colleague Dr Jason White, investigated the possibility of improving plant disease resistance by enhancing their uptake of different micronutrients using nanoparticles. 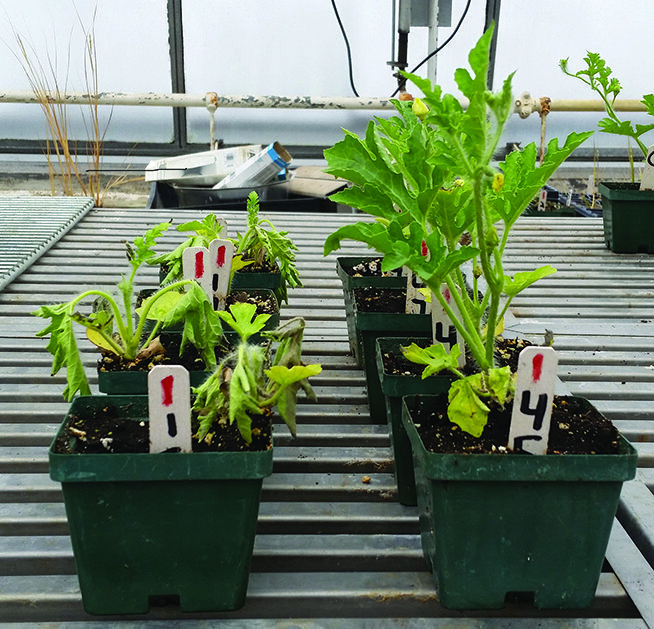 The team sprayed solutions of six different types of metal oxide nanoparticles onto the leaves of tomato and eggplant seedlings, which were growing in a greenhouse. These plants were then grown in soils or soilless medium, which had been deliberately cultured with Fusarium wilt fungus or a Verticillium wilt fungus – common pathogens known to infect them. After three weeks, the leaves of the plants were examined for signs of disease. The team also recorded the number of fruit growing on the tomato plants, and measured their weights, and assessed the size of leaves on the eggplants. 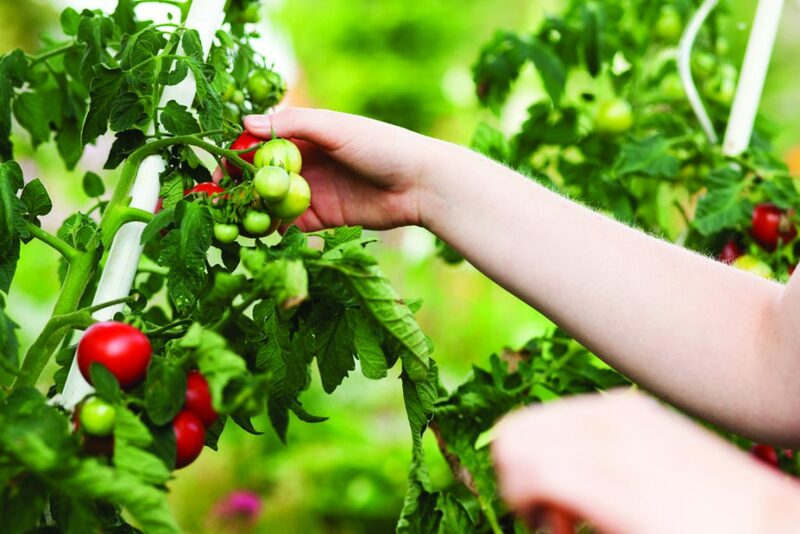 Of the six types of metal oxide nanoparticles tested, they found that those containing copper, manganese and zinc all reduced the presence of disease, while copper in particular boosted crop yield for both tomatoes and eggplant. The next step in this experiment was to investigate how the copper nanoparticles were helping the plants to resist disease. Dr Elmer wanted to find out whether the copper was directly influencing the fungal disease, or if it was having an effect on the plant’s overall health and disease resistance. If it was directly inhibiting the disease, then applying nanoparticles to the soil where the disease was present would make more sense than spraying them onto the plants’ leaves. However, if the copper was somehow enhancing the plants’ health and disease resistance, then applying the nanoparticles onto the leaves would be the most effective option. An analogy to consider is the way we try to avoid getting the flu – we can either sterilise infected surfaces to lessen our chances of coming into contact with the virus, or bolster our immune systems so that we can fight off the infection when it occurs. What Dr Elmer discovered was that the copper did not directly attack the disease in the soil. Instead, it appeared to be taken up by the plant and used to increase disease resistance. When they cut up the copper-treated plants after the experiment, Dr Elmer and his team also found that the roots contained increased levels of this micronutrient. This suggests that the nanoparticles can move within the plant from the leaves down into the roots, where they are used to boost plant health and disease resistance. During the experiment, the team had taken care not to spray any of the nanoparticle solution onto the soil or soilless medium. Therefore, they were confident that the nanoparticles had not been directly taken up by the roots, but were instead transported through the plant from the leaves. Due to their tiny size, nanoparticles of copper and other elements behave much differently to larger particles. They are much more mobile, allowing plants to easily absorb them. A side-effect of this is that too much of one element can produce toxic effects within the plant. Additionally, plants containing high levels of certain elements can potentially be harmful to the people that ultimately consume them. Copper in particular can cause problems if too much is supplied to the plant – it can cause direct toxic effects as well as preventing other vital micronutrients from being taken up by the plant. Through the use of nanoparticles, Dr Elmer’s team were able to deliver very small amounts of copper to young plants – enough to improve their disease resistance without inducing toxicity in the plants, or creating levels unsafe for human consumption. Even in relatively small amounts, these nanoparticles are taken up so effectively by the leaves that they are much more efficient than larger particles. Another important result from the team’s experiments was that the effects of a single dose lasted a long time, often throughout the entire growing season. This means that a small dose early on in the plant’s life might be enough to maintain disease resistance all the way to harvesting time. If this is true, then micronutrient dosage could be kept smaller, enabling farmers to grow food safely with improved yields and less disease risk. This would also mean lower amounts of these elements released into streams and waterways, therefore reducing environmental impact. Dr Elmer plans to carry out further work to explore the ways in which plants take up nanoparticles and how they transport them from the leaves to the roots. He wants to particularly focus on pathways that have been identified as important for plant health and disease resistance. This is an important question, as applying these micronutrients in other non-nanoparticle forms do not have the same effect – and researchers have typically struggled to get micronutrients to move from the above-ground part of the plant down into the roots. Dr Elmer also wants to find out whether these nanoparticles have the potential to cause unsafe micronutrient levels in the fruits of tomato and eggplant crops. This will involve exploring the processes that are involved in nanoparticle absorption and movement throughout the plant. His team have already found a way to boost micronutrient concentrations in the roots and leaves of the plants, while leaving the fruits unaffected. How and why this happens is not yet clear, and Dr Elmer is keen to explore further. If an explanation can be found for why the fruits maintain normal levels of micronutrients, then this will be able to reassure farmers and customers that nanoparticle application of micronutrients is completely safe. Moreover, if Dr Elmer and his team can solve the problem of making micronutrients available to the right part of the plant, then this will open the door to further questions that need answering in order to improve the use of nanoparticles for plant disease resistance. Dr Elmer also plans to investigate the best way to apply these micronutrient nanoparticles, and the optimal amounts to use for each crop species. Finally, his team also hopes to identify the mechanisms responsible for the plants’ improved disease resistance, and currently Dr Elmer is trying to work out if (and how) the copper nanoparticles help the plant produce chemicals in its cells that are harmful to disease. Dr Wade Elmer obtained an MSc in Plant Pathology at VPI&SU in 1981 and a PhD in Plant Pathology at Michigan State University in 1985. He then joined the Connecticut Agricultural Experiment Station in 1987 as an Assistant Scientist, where he has now been working for the last 30 years. Since 2015, Dr Elmer has been the Chief Scientist of the Department of Plant Pathology and Ecology at the Connecticut Agricultural Experiment Station. 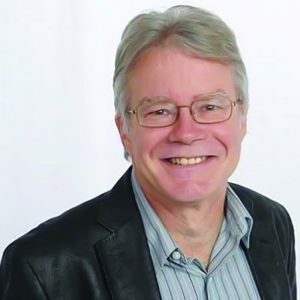 Dr Elmer has been a member of the American Phytopathological Society (APS) since 1979, and has held several committee roles in the Northeast Division of the Society, including President in 2006. He also acted as an editor on several crop disease journals, including Plant Disease, Crop Protection and Phytopathology. He was awarded the CHOICE Award for Best Outstanding Academic Title in 2008 as an author for Mineral Nutrition and Plant Disease (APS Press, St. Paul, MN). WH Elmer, JC White, The use of metallic oxide nanoparticles to enhance growth of tomatoes and eggplants in disease infested soil or soilless medium. Environmental Science Nano, 2016, 3, 1072–1079.